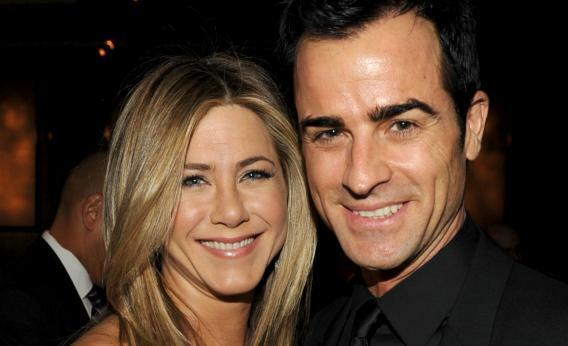 Jennifer Aniston and Justin Theroux's engagement: the guilty pleasure of tabloids. HOLLYWOOD, CA - JANUARY 28: Actress-director Jennifer Aniston and actor-director Justin Theroux attend the 64th Annual Directors Guild Of America Awards cocktail reception held at the Grand Ballroom at Hollywood & Highland on January 28, 2012 in Hollywood, California. I was happy to read over the weekend that Jennifer Aniston, who since her 2005 divorce from actor Brad Pitt has been the subject of tabloid speculation over her relationship status and feelings about said status, had become engaged to her boyfriend of more than a year, actor, screenwriter and director Justin Theroux. It wasn’t just that I was pleased for Aniston, who has given me many hours of enjoyment as an actress, and who now is out from under the burden of being America’s Favorite Sad Single Lady. It’s that for one brief moment, the news of her engagement beats the tabloids who have tried so hard to define Aniston on their own terms, giving them a story that’s better than anything they can make up, and making me feel momentarily less terrible about a truly guilty pleasure. Gossip magazines are the last bastions of American journalism unfettered by the normal constraints of the profession. People Magazine may retain some of its respectability, and gets its share of exclusive coming out stories and celebrity wedding and baby pictures, but its competitors remain foot-loose and unencumbered by the facts. Relatively neutral photographs are interpreted whatever way will pique pageviews and cover-lines, or read for body language retroactively, as with the snaps of Kristen Stewart at dinner with Rupert Sanders, her married director on Snow White and the Huntsman with whom it emerged that she was having an affair. No touching? No problem: Us Weekly read the fleeting expressions on their faces with all the voraciousness and certainty of augurs picking through entrails. Sources are “close friends” with the stars in question, or “in a position to know.” Health experts have never treated the celebrities they analyze. The story can change radically from one week to the next, and nobody cares, no corrections required, and it doesn’t occur to anyone to question the utter inconsistency of the narratives tabloids sell us. It’s no wonder that fan fiction is such a big deal in America—we’re used to paying for hard copies at the airport or reading them at the hair salon (my two favorite methods of indulgence). There’s something hilarious about the fact that we look askance at individuals who treat fictional characters and real people as if they’re paper dolls, be the subjects of their online writing be Harry Potter characters or members of the American men’s Olympic swim team, when we effectively have an industry dedicated to selling us those same fictions with a veneer of credibility. Unlike most things we call guilty pleasures, gossip rags are something it’s actually possible to feel bad about consuming: we know that the paparazzi are invasive, that the bodysnarking these magazines feature put real pressure on real women, that paying for stories and access does not do anything to enhance journalistic ethics. I wouldn’t be in favor of importing the stringent press laws that give celebrities more ground to sue tabloids in the United Kingdom, but opposing legislation to regulate the tabloids doesn’t make them virtuous. The speculation will start up again immediately, of course. When will the wedding be? What will Aniston wear? Will Aniston bestie Courtney Cox be her maid of honor, and what will she wear? Is she pregnant? Will Brad and Angelina attend? Whatever will this do to the Eternal Jen-Angelina Feud? Will Kristen Stewart replace Aniston as the Sad Celebrity Lady Cash Cow? But for one day, at least, what’s good for Jen is good for journalism, and good for gossip junkies, be we clandestine or professed. It’s nice when true guilty pleasures can be a little bit less sinful.